Cardiff Beauty Blogger - Sindyydoll ♥ Makeup - Welsh beauty blogger - British Beauty Blogger: How to clean make up brushes. Questions and Comments MUAs get often #2. How to clean make up brushes. Questions and Comments MUAs get often #2. Continuing with my MUA questions series, today's post will be about cleaning brushes. Ideally you need to be washing them twice a week, and spot cleaning them with brush cleaner throughout the week to keep your brushes clean and germ free, but I know it can be a struggle with time to do this. It's simple, easy and you should include it in your house and beauty chores list. Not only will your make up go on a lot better, you'll notice clearer skin, and a better finish to your overall look. Read more to see why, and how to clean brushes quickly and cheaply! 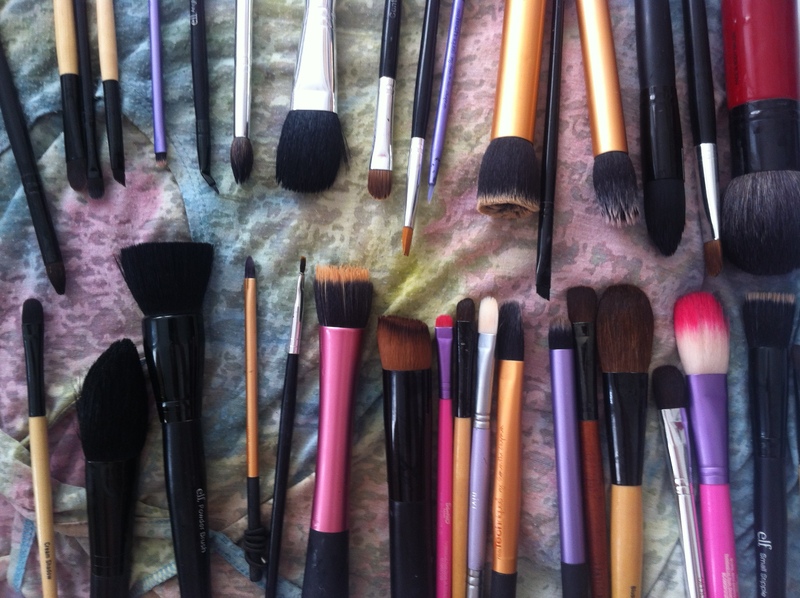 So how often should you clean your brushes? If you're a make up artist, after every client you should deep clean your brushes, which is what I'll be showing you how to do below. This helps with keeping your brushes in tip top condition and of course sanitized and clean for the next client. Obviously if you're doing more than one persons face, this is where brush cleaner comes into play but after you finish the session / day go home and clean your brushes. Being smart about client hygiene should be your priority, as cross contamination can lead to angry clients. If you're using them on a day to day basis on yourself, realistically speaking, I know not everyone will have the chance to deep clean their brushes. You should be aiming to deep clean your brushes twice a week or twice a fortnight. Do you need special brush shampoo? In short, no! You can use anything to deep clean your brushes, as long as you get all of the make up out of the brushes. You should not use conditioner on your brushes as it makes bristles soft, which means it may not apply like it used to and can misshape them. Myself, I use a cheap body wash usually with citrus to cut through oils, or a cheap shampoo. I know some people use baby shampoo, any shampoo to be honest is fine. You don't need to spend a lot of money on an expensive brush cleaner as they all do the same. What do you need to wash your brushes? There are many ways to wash your brushes, some people soak them, which I don't recommend as it can make the glue from the ferrule, (usually the metal part of a brush that holds the bristles in and attaches it to the wooden/metal handle) loose and melt away and this is how brushes can shed. So I usually wet my brush, place some shampoo on my hands or on the brush and swirl around in my hand then rinse off under water. This is my usual choice in brush wash as it gets the job done. It has lemon which cuts through oils and grease and tea tree which is a known anti bacterial ingredient. Start off by quickly running the brush under warm water, not too hot as it can melt the glue, I pour the wash on my hand and make my hand into a cup shape. From that I swirl the brush around clock wise and anti clock wise to make sure the cleaner gets on all bristles and it lathers up well. You can also massage it in but try not to be too rough as it can matt the brush hairs. After this I rinse the brush under warm water again getting all of the product out, I repeat this step if it has a lot of product to make sure it's as clean as possible. You want to make sure the water is crystal clear. After that, squeeze out all the water then shape the brush into it's original shape, like the image above. If you don't do this it dries the way it is left, and will not apply product properly and generally looks like a messy brush. You can, use paper towels to get the majority of water out by rubbing it in the paper towel then reshaping, this just helps speed up the drying process. Place the brush on a flat surface on a towel or anything that absorbs water well. Leave overnight to dry. Do not place on a radiator as it can melt the glue, or use a hair dryer as again, it can melt the glue. That's pretty much it, repeat for all brushes you have. Takes me around 45 minutes to wash all my brushes, but I like to repeat the process on some brushes to make sure all product is out. You can place the cleaner on the brush directly then swirl it around in your hand. You can also make up a put with some cleaner/soap/shampoo in, and swirl it around then swirl it in your hand, but I don't like this as the brush cleaner gets messy quickly and you need to keep changing the solution. If you have a lot of smaller brushes like the ones below you can wash them all at once rather than individually. Just make sure that all brushes are clean, and you may want to repeat the process. And that's pretty much it. Here's how all my brushes look after I wash them. Make sure you reshape them and leave them alone until they're dry. Any questions ask away and I'll try and help!